Menkyo Hanshi Hassan began studying martial arts in 1957, in his hometown of Philadelphia, Pennsylvania. Since that time, he has studied many different disciplines such as Judo, Karate, Aikido, Jiujitsu, Boxing, and Kempo. In the early ‘70’s, Menkyo Hanshi Nimr Hassan sought out the Great Grand Master James Masayoshi Mitose, who is considered the Great Grand Master of all the Kosho Shorei Ryu Kempo systems in the world. Menkyo Hanshi Hassan was selected over other candidates to become the “ichi deshi” (disciple/only student) of the Great Grand Master and is the only non-family member taught the family’s Temple Dance/Escaping Art Pattern system. This system includes the physical, mental, and spiritual aspects of the Koga Ha Kosho Shorei Ryu Kempo system. Menkyo Hanshi Hassan, an exponent of the martial arts when he met James Mitose, would journey to Mitose’s home day after day and train for hours in the backyard. Mitose taught Hassan the basics of Karate, which Mitose had learned from Choki Motobu, his maternal uncle, the great Okinawan Shorei Ryu Kempo Karate Master. Mitose taught Hassan Jiujitsu, which Mitose had learned from his Masters at the temple in Japan. More importantly, Mitose taught Hassan the “System”. In 1974, Menkyo Hanshi Hassan was issued a Master Instructor’s License and presented with the Mitose family crest by the Great Grand Master James Mitose. This honor bestowed upon Hassan allows him to teach the wondrous art of Koga Ha Kosho Shorei Ryu Kempo. Hassan has maintained the complete art taught to him and teaches it under the full title of Koga Ha Kosho Shorei Ryu Kempo. This title reflects all three arts designated on the family crest. That same year, Menkyo Hanshi Hassan opened a dojo under the guidance of the Great Grand Master Mitose and was given the charter and permission to promote, display, and use Kosho Shorei Ryu Coat of Arms. Menkyo Hanshi Hassan is the only surviving student in the Continental U.S. taught by Great Grand Master James M. Mitose. Also, he is the only Menkyo Hanshi who teaches the ancient and traditional Koga Ha Kosho Shorei Ryu Kempo’s Temple Dance/Escaping Art systems. Menkyo Hanshi Hassan received his Master’s Degree in Human Services and is pursuing a Ph.D. in Sociology/Psychology. In July 2005 he will be recognized as and given the Living Legends award by the Hawaiian Martial Arts International Society. 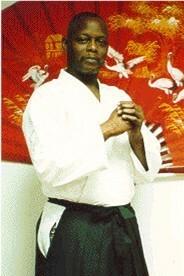 In 2004, he was inducted into the World Head of Sokeship Family Council Hall of Fame as the Grandmaster of the year. In 2003, he was inducted into the Hawaiian Martial Arts International Society Hall of Fame as the Grandmaster of the year. In 2002, he was inducted into the U.S. Martial Artists Association Hall of Fame as the Supreme Grandmaster of the year. Also, in 2002 the World Head of Family Sokeship International Council Hall of Fame recognized him as the Humanitarian of the year. In 2001, he was inducted as a member of the Pioneer and Legends International Martial Arts Society Hall of Fame. In 1993, he was ranked No. 1 in the Mid-Atlantic Division of the National Black Belt Association and No. 9 in the world at the National Black Belt Grand World Championships in New Orleans. Also, in 1993, Dr. William Durbin, Soke-Koyojute Ryu Kempo Bugei, and Ann Nooner, Habshi-Kiyojute Ryu Kempo Bugei, recognized him as the Menkyo Hanshi. In 1991, he ranked No. 1 in the Eastern Alliance Grand Championship, Executive Division. In 1986, he received the honorary rank of Shichi Dan (7th Degree Black Belt) from the Great Grand Master William K. S. Chow, head of the Kara Ho and United Kempo Jiujitsu Association. [Great Grand Master Chow was one of Great Grand Master Mitose’s students in 1948]. This rank was given to Menkyo Hanshi Hassan for his continuous efforts to preserve the ancient and traditional teachings of the Mitose family system. Among Menkyo Hanshi Hassan’s notable achievements he has also taken the “system” and implemented it with great success in three Philadelphia public school systems: Wilson Elementary, Wagner Middle School, and Martin Luther King High School. He completed an educational/behavioral research project with Thomas Jefferson Universities Hospital Department of Psychiatry, and the District of Philadelphia. He completed a five year research project with the University of Pennsylvania’s Graduate School of Education in Psychology (W.E.B. DeBbois Collective Research Center), Columbia University, and North Carolina at Chapel Hill. And he is certified by the institution of Certified Martial Artists under the auspices of the Department of Defense as a judge and referee for that institution and the National Black Belt League. Author of the book ” The Kempo History of Masayoshi Mitose “.